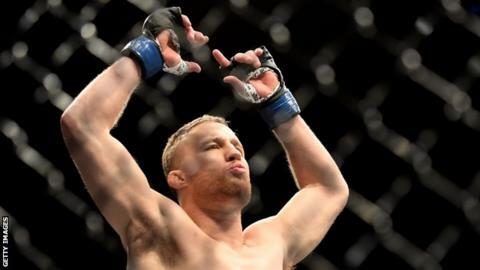 Justin Gaethje marked himself out as a contender in the lightweight division with an explosive first-round knockout of Edson Barboza at UFC Philadelphia. Gaethje's win over the Brazilian was his second knockout victory in a row following back-to-back losses. "There are five or six guys in front of me, I want every one of them," said the 30-year-old American. Earlier, Scotland's light-heavyweight Paul Craig beat Nigerian Kennedy Nzechukwu with a late submission. "We're in the home of Rocky, I had to go for the last-second submission. It's a hard game but I love it," Craig said, 31. Gaethje's win in the 155lb division in the main event at the Wells Fargo Center left him with a record of 20-2-0. "I would not recommend this sport to my worst enemy, but I was born and I was bred to do this. And I will do it until the wheels fall off," he said. In the co-main event, Sweden's Jack Hermansson earned a first-round submission over American David Branch at middleweight. There were also victories for Josh Emmett, Michelle Waterson and Sodiq Yusuf on the undercard.